Home »Products »Reverse Osmosis – Nanofiltration »RO : why should I use it ? Reverse osmosis and nanofiltration are methods of liquid phase separation by permeation through semi-selective membranes under the influence of a pressure gradient. A semi-selective membrane is a membrane allowing some material transfer between two media it separates, prohibiting other or generally favoring some over others. It can retain both the monovalent ions and divalent ions. The abatement rate is expressed as a percentage of the total salinity. Polymem has the necessary know-how in the design of reverse osmosis systems that require sizing and equipment selection (membranes, pumps, instrumentation …) and appropriate building materials. 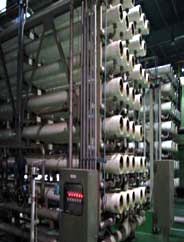 The operational reliability and the life of the reverse osmosis membranes are highly dependent on proper pretreatment implemented. The Polymem ultrafiltration is the ideal pretreatment to reverse osmosis (or nanofiltration) for the reduction of turbidity and SDI (Silt Density Index), which helps ensure proper operation and life of membranes ‘reverse osmosis.